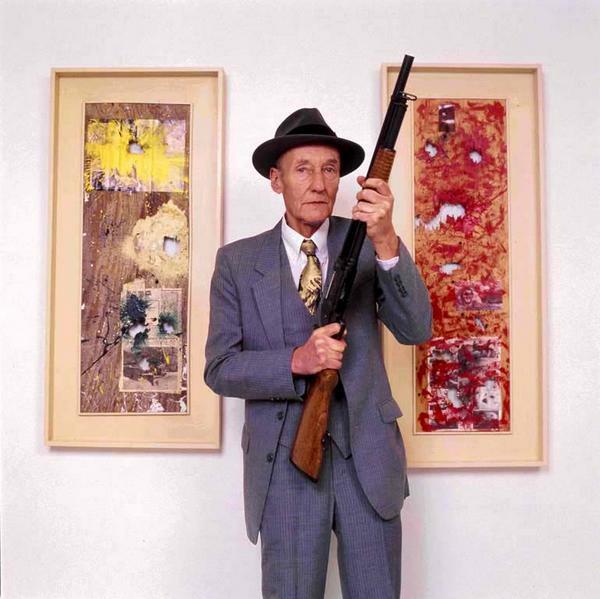 During his later years in Kansas, Burroughs developed a painting technique whereby he created abstract compositions by placing spray paint cans in front of, and some distance from, blank canvasses, and then shooting at the paint cans with a shotgun. These splattered canvasses were exposed in various Galleries during the early 1990s. BURROUGHS: Oh, all kinds. Brushwork. Shotgun. Paint. Knife. EGO: What exact process do you use for your visual art? BURROUGHS: There is no exact process. If you want to do shotgun art, you take a piece of plywood, put a can of spray paint in front of it, and shoot it with a shotgun or high powered rifle. The paint’s under high pressure so it explodes! Throws the can 300 feed. The paint sprays in exploding color across your surface. You can have as many colors as you want. Turn it around, do it sideways, and have one color coming in from this side and this side. Of course, they hit. Mix in all kinds of unpredictable patterns. This is related to Pollock’s drip canvases, although this is a rather more basically random process, there’s no possibility of predicting what patterns you’re going to get. I’ve had some I’ve worked over for months. Get the original after the explosions and work it over with brushes and spray paints and silhouettes until I’m satisfied. So, there isn’t any set procedure. Sometimes you get it right there and you don’t touch it. The most important thing in painting is to know when to stop, when everything is finished. Doesn’t mean anything in writing. EGO: It does rely to a high degree on chance — the shotgun art? BURROUGHS: It introduces a random factor, certainly. EGO: Just like the cut-up method. BURROUGHS: Yes. But you don’t have to use it all, you can use that as background. There’re a lot of other randomizing procedures like “marbling.” Take water and spray your paint on top of the water and then put your paper or whatever in the water and pull it out and it sticks in all sorts of random patterns. And then there’s the old inkblot. [Ruffles imaginary paper] Like that. Sometimes they’re good only as background or sometimes you get a picture that you’re satisfied with at once. There is no certain procedure. EGO: Allen Ginsberg proposed to me that the cut-up technique you developed with Brion Gysin is a sort of counter-brainwashing technique. Do you agree with that? BURROUGHS: It has that aspect in that you’re breaking down the word, you’re creating new words. Right as soon as you start cutting, you’re getting new words, new combinations of words. Yes, it has that aspect, sure. But remember that all this brainwashing and propaganda, etc., is not by any means expected to reach any intelligent corners. It isn’t expected to convince anybody that has any sense. If they can get ten percent, that’s good. That’s the aim of propaganda; to get ten percent. They’re not trying to convince people that have a grain of sense. Wanna see more? Trespass! (click).